NV10｜Hybrid Pianos｜Products｜Kawai Musical Instruments Manufacturing Co., Ltd.
mechanism, with the latest digital sound and amplification technologies. with all the practicality and convenience of a modern digital. Introducing the Novus NV10 – a hybrid instrument that delivers the true grand piano experience. Koichi Kawai designed and built the first complete acoustic piano action in Japan in the early 1900s. In the decades that have followed, Kawai engineers continue to pursue the company founder’s quest for perfection, pioneering the use of state-of-the-art materials and designs that advance the piano art form. 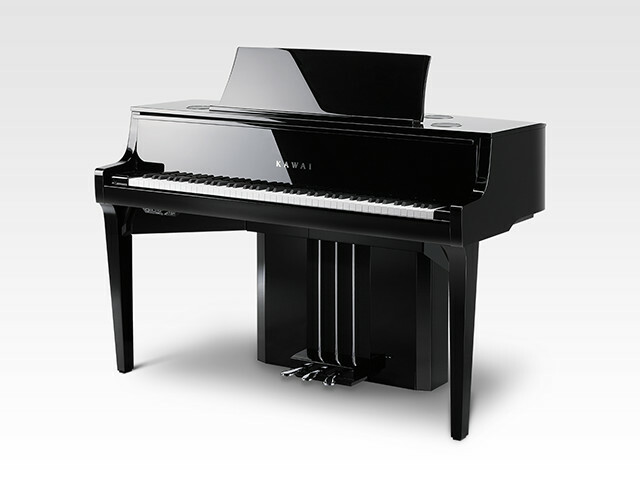 The Millennium III grand piano action found in today’s Kawai GX series instruments exemplifies Koichi’s philosophy. This highly-coveted action incorporates components produced using ABS Carbon, an extremely sturdy and rigid composite material that allows these action parts to be stronger, lighter, and faster than their conventional wooden counterparts. 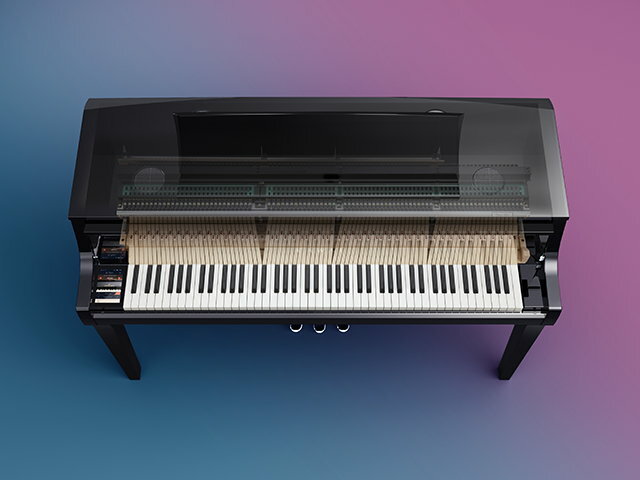 In addition, Kawai GX series grand pianos also utilise extended-length key sticks, providing greater control and a more even response from the front to the back of the playing surface. The Millennium III Hybrid action represents the latest milestone in Kawai’s rich legacy of piano innovation, and serves as the centre-piece of the Novus NV10. Based on the GX series’ proven action design, Millennium III Hybrid retains the composite parts and extended key sticks of its acoustic cousin, while replacing the traditional felt hammers with individually-weighted ABS equivalents. As a hybrid piano, there are no metal strings inside the Novus for these hammers to physically strike when the keys are played, therefore their precise movements are instead captured using high-resolution optical sensors mounted above the action. Millennium III Hybrid delivers all of the benefits of a premium Kawai grand piano action within a digital instrument. This feat of modern engineering allows pianists of every level to enjoy the unmatched feeling of playing an acoustic grand piano, regardless of the time of day, or the size of their home. The dampers of an acoustic grand piano consist of soft felt pads that rest directly over the instrument’s metal strings, effectively muting their vibrations. As each piano key is pressed and the string is struck, the corresponding damper lifts off the string, allowing it to vibrate freely, and for the note to sing. While the keyboard action activates dampers individually, the damper pedal is used to lift all of the piano’s dampers simultaneously. This allows all of the instrument’s strings to vibrate and resonate in sympathy, creating a wonderfully rich sound and sustaining notes even after their respective keys are released. The damper mechanism therefore plays a pivotal role in influencing the overall sound of a piano. However, the process of raising and lowering dampers also has a subtle but noticeable effect on key touch, with the weight of the action gently easing when the damper pedal is depressed. This natural interaction between keyboard and pedals is a fundamental characteristic of every grand piano, and one that requires patience and skill to master. The Novus’ beautiful chrome plated pedals and exposed pedal rods are sourced from the same GX series instruments as the premium Millennium III keyboard action. Moreover, in addition to featuring a full grand piano action, the Novus NV10 is the first hybrid instrument to also incorporate a real grand piano damper mechanism. Again, there are no metal strings inside the Novus to require physical damping, as the instrument’s sound is produced digitally. However, in order to reproduce every aspect of playing a grand piano, the NV10 retains the damper mechanism behind the keyboard action, with graded weights attached to each damper lever replicating the load of traditional wood and felt parts, as the keys and pedal are pressed. This innovation allows pianists to not only hear how the damper pedal affects the Novus’ generated sound, but also feel the various mechanical interactions through their hands and feet. Such attention to detail is unprecedented in a digital instrument, and further reinforces the NV10’s objective of delivering a true grand piano playing experience that is indistinguishable from the real thing. 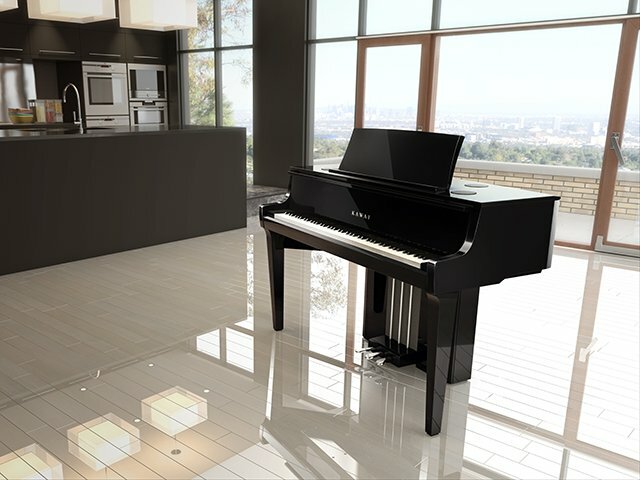 “ The Novus is the best hybrid piano I’ve ever come across. The spirit of the Shigeru Kawai SK-EX concert grand piano is at the heart of the Novus NV10. Each world-class instrument is hand-crafted by Master Piano Artisans (MPAs), utilising the finest available materials to ensure optimum touch, tone, and artistic expression. Widely regarded as ‘the premier piano of Japan,’ the SK-EX graces the stages of concert halls and musical institutions around the globe, receiving universal acclaim for its magnificent tonal clarity and exceptional dynamic range. In order to reproduce the stunning tonal qualities of the Shigeru Kawai concert grand piano digitally, the NV10 incorporates Kawai’s latest SK-EX Rendering technology. This advanced piano sound engine combines the well-established process of sampling with the modern approach of physical modelling, to produce a piano sound that is both rich in natural acoustic character, and dynamically responsive to the player’s musical desires. As the most authentic recreation of an acoustic grand piano, the Novus NV10 also provides a variety of options to personalise the instrument through the powerful Virtual Technician feature. As the name suggests, this convenient function simulates the numerous voicing and regulation adjustments performed by a skilled piano technician virtually, allowing discerning musicians to shape characteristics of the Novus to suit their unique personal preferences, or match a certain style of music. Developed in collaboration with Onkyo, one of Japan’s leading premium audio equipment manufacturers, the NV10 features specialist filtering and amplification components designed for high-resolution sound reproduction. This technology helps to preserve the unique harmonic characteristics of the Shigeru Kawai piano, delivering the true concert grand experience through the Novus’ speaker system with power, depth, and clarity. “ I was very happy to settle down to playing Rachmaninov on the Novus. In addition to housing the keyboard action, damper mechanism, and pedal system of a grand piano, the Novus’ stunning ebony polish cabinet exhibits numerous other acoustic piano characteristics that enhance the instrument’s form and function. The NV10’s grand piano-like music rest is broad enough to accommodate the most ambitious of musical works, with tapered edges and simulated leather lining the base. The viewing angle can be easily adjusted to suit the performer’s height and posture, while a special ‘composer desk’ position provides optimum comfort and productivity when annotating or transcribing scores. With its classic curved side arms, the Novus’ acoustic piano inspired cabinet design also boasts an actual grand piano fallboard. This generously-sized keyboard cover incorporates Kawai’s Soft Fall system with dual-damping mechanism, to ensure a smooth, ultra-slow shutting motion that protects both the player’s hands and the instrument’s finish from a jarring close. While the Novus’ core features are unquestionably derived from an acoustic piano, the instrument neatly incorporates various additional technologies that provide the modern conveniences of a premium digital piano. These features are primarily controlled through the NV10’s touchscreen LCD, which is discretely embedded within the instrument’s left cheekblock. This high resolution touchscreen allows sounds and settings to be adjusted from an attractive user interface simply by tapping or swiping the display with a finger. For piano purists, the screen can be set to turn off automatically while playing, thus preserving the Novus’ classic appearance, and minimising any visual distraction to the performer. Unlike an acoustic piano, the Novus provides a variety of options for connecting to other devices, with audio jacks that allow the instrument to be amplified in halls and other large settings, and USB and MIDI ports for transferring music data to and from a computer. The NV10 even supports Bluetooth®, providing an effortless way to connect and enjoy smart devices wirelessly. “ Next to its great design, the Novus impresses me with its amazing touch. * Depending on market location. Specifications are subject to change without notice.